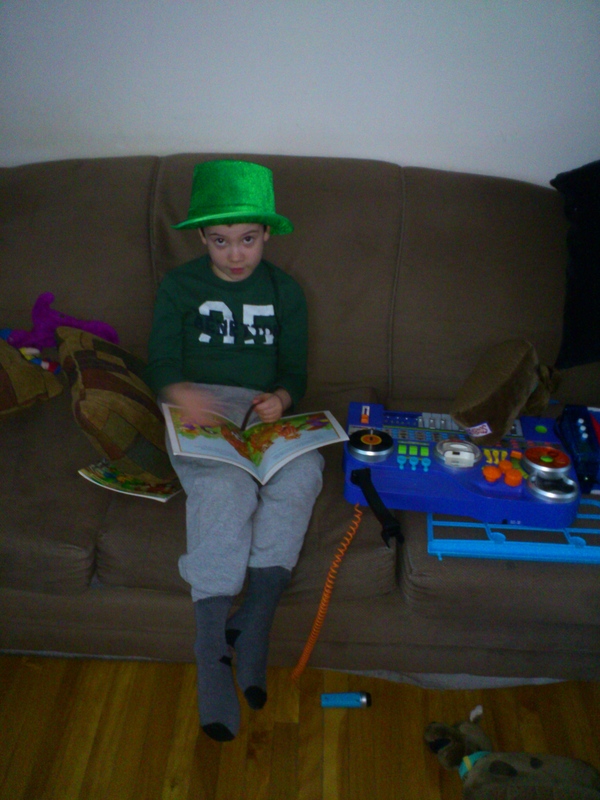 Michael’s Take on St. Patrick’s Day: Children and Celebrating The Little Moments! Having kids has really helped me learn to slow down, enjoy the little things, and celebrate life once again in a way I haven’t done in awhile. Today being St. Patrick’s Day is just one example. “Mommy, we’re going to have a party at school tomorrow for St. Patrick’s Day. Can I wear a green shirt? Can I wear my green St. Patrick’s Day hat too?” Michael asked me yesterday afternoon. And yes ladies, there are St. Patrick’s Day decorations up in my house. I never used to buy any, though I would wear green to work, but with Michael these one day holidays need to be marked with decorations just like Christmas and Easter. Though I was always big on Valentine’s Day too, it has only been since Michael was born that I began buying Valentine’s decorations. His whole face lights up when I take out the bag of holiday decorations. We have one for Halloween, Christmas, Valentine’s, Easter, and now St. Patrick’s Day. Thank you Dollar Store! 🙂 He is bringing out the kid in me. He is happy with the little things, having his favorite meal, desert, going to a favorite place like the library or a park. I’m sure all of you Moms have similar stories about those wonderful moments your kids have re-introduced back into your life, the times you took for granted with all the things you have to do in a day. Now walking down the street can be a new experience as they notice things you don’t. “Look at that tree Mommy, what’s the name of it?” More and more each day, I am learning to celebrate each moment, each day as special, and you can be sure that I will have some green on our dinner plates tonight (probably broccoli or Kale, yes he actually likes that! ) 🙂 along with a little brew of my own in honor of the day afterwards. Happy St. Patrick’s Day everyone! Until next time.